← Moose! A Herd in the Weminuche Wilderness. In the years of my field research, exploring the desert wilderness after a generous rain was always an exciting time. Desert rains give way to a biologically rich landscape, suddenly blooming and booming with new life. Remarkable life-forms reveal themselves from their hidden forms, gracing us with their presence only briefly until the moisture of the earth dissipates once again. 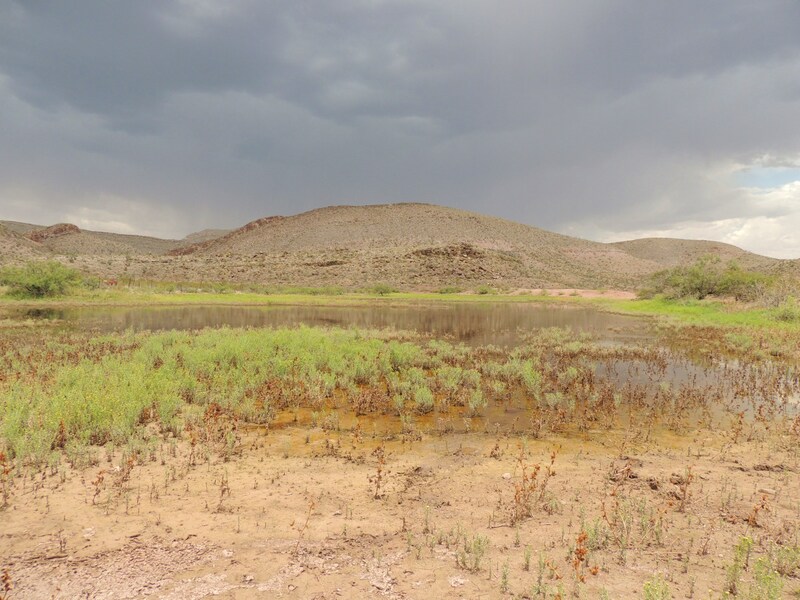 Most of the year, carrying out field research tasks involved transversing about the dry and hot desert, paying little attention to the desiccated seasonal pools. Then, the storms appear; bringing with them bountiful amounts of rain. A moment we have all secretly and outwardly hoped for. Immediately after the rains, the desert comes to life as the arroyos swell and sticky creosote leaves open releasing that magical desert fragrance. Road-like riverbeds suddenly distend into the banks, becoming a roaring river for just a while, carrying along enormous mesquite branches and other vegetation as to reveal its power. Then, the thirsty earth soaks up puddles of water as if taking in refreshing gulps of nourishment and the grounds are clear again and remain pleasantly moistened. The river too, disappears seemingly just as fast as it swelled before. More excited than the last visit to the research station, I grab my hat, field journal, camera and other gear and make the 20 minute long ATV drive on the abandoned dirt road to the opening of an arroyo where a small ephemeral lake bed sits. This time, there is water. The lake makes its appearance so seldom I take the opportunity to explore its banks thoroughly, jumping enthusiastically at the sight of even the slightest insect flutter. After combing the banks of vegetation for interesting plants and insects, I follow coyote tracks in the mud that lead me to the water’s edge. Peering into the water I can see the graceful and delicate creatures swimming about. A wonderful and mostly inconspicuous creature belonging to the branchiopod order Anostraca, commonly called Fairy Shrimp which live their lives exclusively in remote, temporary pools just like this (Fig. 1). Birds and other creatures follow their lead as fairy shrimp are a very important food source for many desert dwelling animals and migratory birds alike. Fairy shrimp are tiny freshwater crustaceans related to lobsters, shrimp and crabs. Crustaceans are typified by having three main body parts: a head, a thorax and abdomen. Measuring only 10 – 44 millimeters in length, fairy shrimp are characterized by paired compound eye stalks and eleven pairs of legs called phyllopods which also function as gills. A pair of appendages located at the mouth act as jaws; short pair of antennae adorns the head and a long tail, with a forked terminus called the caudal furca, provides agility. Fairy shrimp swim ventral side up, moving its gills (phyllopods) in a wave-like pattern collecting particles of food as it glides gracefully through the water. Their colors can range from translucent red-orange, red with white, pale blue and green. Fairy shrimp are sexually dimorphic; females can be distinguished from males by having a translucent brood pouch with eggs. Whereas males lack a brood pouch and may have a distinguishable second pair of elongated antennae used to grasp females while mating. The lifespan of fairy shrimp is very brief and they can take as little as 18 days to develop depending on the species as well as the speed in which water is evaporates from the pool or even by amount of predation that occurs. Most fairy shrimp take up to 41 days to fully mature and must reproduce as soon as they are able to secure a future generation. Almost immediately after mating, eggs called cysts begin to develop within the female brood pouch. Females will typically produce a clutch of 10 – 150 eggs and can even produce several clutches in one lifetime. When fully formed, the cysts will settle to the bottom the pool where they will await in suspended dormancy, until next year’s rains. Fairy shrimp spend their entire lives in ephemeral pools, often located in very remote areas. 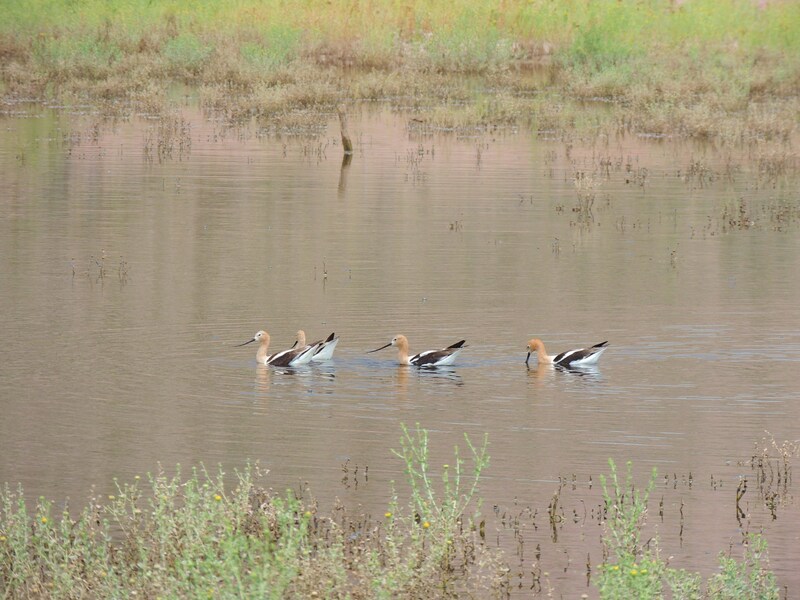 Migratory birds will occasionally land in desert pools from very distant and larger water bodies, transporting cysts of fairy shrimp that stick to their feet. Dispersal of fairy shrimp is not always possible due to the remoteness of desert pools. Some scientists suspect winds may also help distribute fairy shrimp cysts to other water bodies though this may be unlikely since cysts will most likely be embedded in the dried mud. Interestingly, studies have revealed entirely isolated genetic pools from one small body of water to indicating cyst dispersal is not common. Typically feeding on algae and plankton growing in the water food is usually plentiful for the fairy shrimp. Detritus material, bacteria and rotifers are also on the menu. Fairy shrimp have even been observed scavenging on tadpoles, amphibian eggs, mollusks and insect larva. 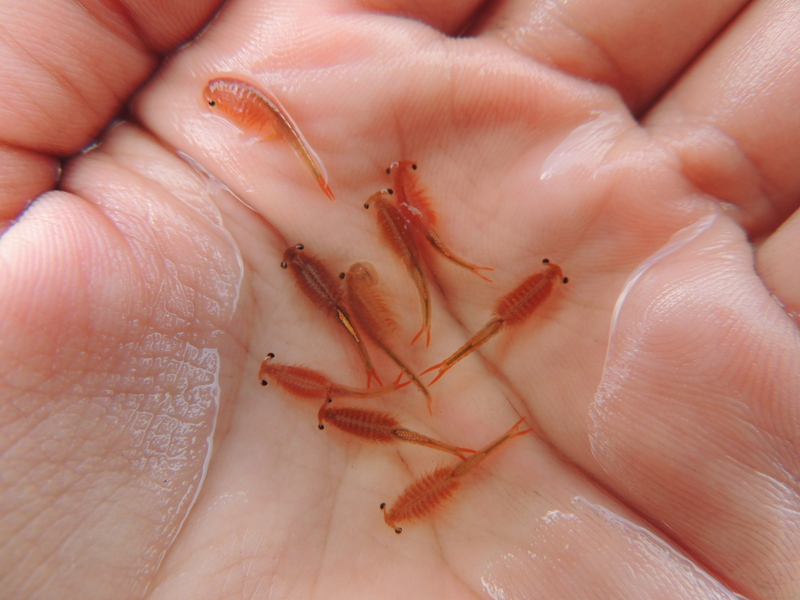 With relatively few natural predators, populations of fairy shrimp are seldom negatively affected by predation. 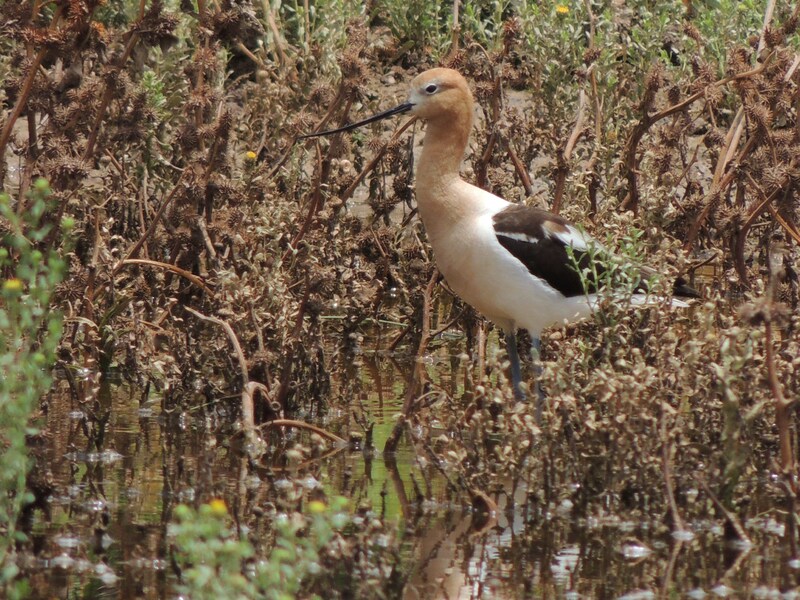 Waterfowl are the most common predator and rely heavily on fairy shrimp on their migratory routes. Amphibians, aquatic beetles and other aquatic insects and larvae may also prey upon fairy shrimp. Since these ephemeral pools are temporary, they do not harbor fish which would likely decimate fairy shrimp populations. Fairy shrimp rely on a “safety in numbers” mode of survival. Predators usually consume a very small percentage of the fairy shrimp population which does not affect the overall population. Unfortunately however, climate change and habitat loss negatively affect fairy shrimp populations and in some cases have wiped out entire fairy shrimp species. Fairy shrimp can withstand long periods of desiccation and can remain as encased embryos called cysts, totally dehydrated and inactive for many years and in some cases decades in the dry mud of pools. These cysts require water to hatch but not just any rain will do. The reanimation of these embryos requires near freezing temperatures accompanied by rain or snow-melt. Only then will fairy shrimp be shaken from dormancy. Most species of fairy shrimp are very small however Branchinecta gigas can grow as large as 150 mm in length. California Vernal Fairy Shrimp, Branchinecta lynchi are considered a threatened species due to loss of vernal pool habitats and the effects of climate change. In the attempt to protect the species from further loss, efforts have been made to protect vernal pool habitats. Branchinecta lynchi are protected under the Clean Water Act. Other wildlife conservation groups such as Nature Conservancy and the Fish and Wildlife Service continue to support conservation efforts.